I'm a big fan of Garbage Pail Kids "Cheap Toys" mini figures, and still remember getting my one and only Cheap Toy as a kid in a bag of "Crummy Candy" at candy store at the mall (it was a peach-colored Thin Lynn, which I still have). Until a few years ago, though, I was unaware that a second series of Cheap Toys was produced. That's probably because Series 2 figures were made in limited quantities and only available in Canada, so tracking down a set of them is a huge undertaking and costs a small fortune. Luckily, collector and toy caster Eric Nilla recently made rubber reproductions of the figures available, offering the opportunity for people who don't want to/can't afford to track down originals to add the sculpts to their collections. I picked up a set a while back, and as soon as I received it I was very happy I did! Probably the most significant attribute that sets these reproductions apart from original Series 2 Cheap Toys is the material. 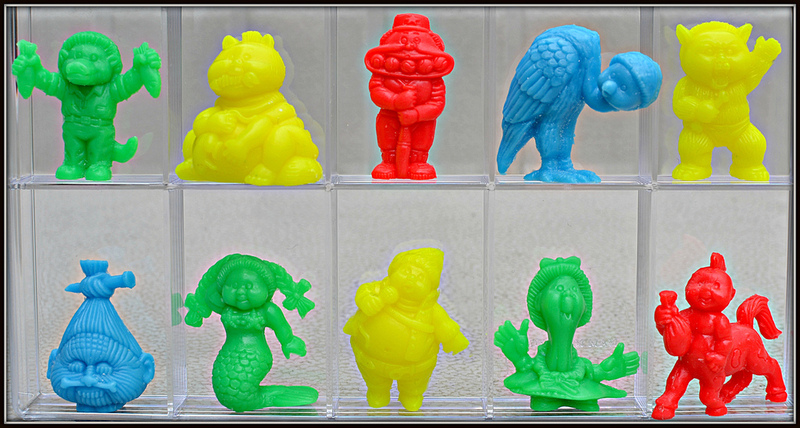 While originals are made of a hard plastic, these reproductions were cast in a soft, keshi-style rubber. 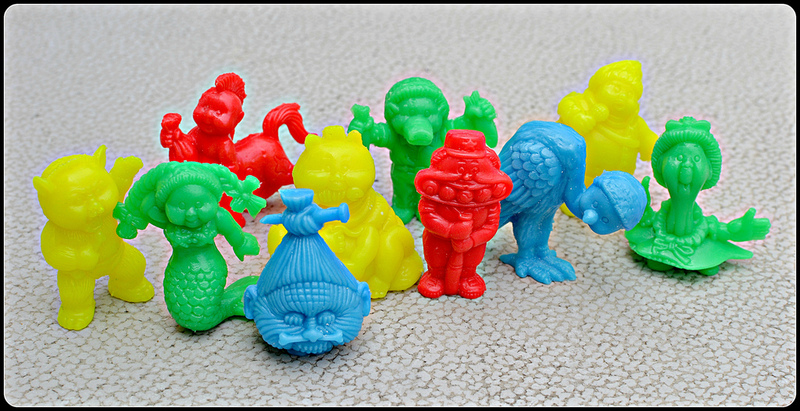 With some of my favorite toy lines being the likes of Monster in My Pocket and Neclos Fortress, rubber is my material of choice for mini figures, so without having ever actually felt a genuine Series 2 Cheap Toy, I'm pretty sure I'd prefer them in this rubbery material. The other difference is color. While these reproductions share the same color scheme as original Series 2 Cheap Toys (red, blue, yellow and green), the hues are slightly different. My versions have a bit more of a neon look--especially the yellows. I really love their vibrant look. I do know that these have been cast by Eric in many other colors, though, including ones that are very different from those of original Cheap Toys. Maybe someday I'll get an original Series 2 Cheap Toy or two, but even if I never do, I'll be happy just owning these beautiful re-casts. What do you think of them? Do you own, or have the desire to track down, any Series 2 Cheap Toys?